Vedānta is the living philosophy of India today and its popularity is due to its being a view and a way of life at the same time. It is a specu­lative enquiry into the nature of Brahman as the highest reality as well as the way of spiritual realization of Brahman as the supreme goal of life. Of the three dominant systems of the Vedānta, Advaita, Dvaita and Viśiṣṭādvaita the Advaita is so well known that the Vedānta is sometimes identified with it, and the Dvaita is regarded as the best philosophic exposition of theism, in spite of its dogmatic and realistic tendencies. It is the merit of the Viśiṣṭādvaita of Rāmānuja as a synthetic philosophy of love that it seeks to reconcile the extremes of monism and theism and, like all mediating systems, it is misunderstood by its followers as well as by its critics. It is called Śrī Vaiṣṇavism in its religious aspect. Among the leading modern exponents of its philosophy there are many who call it qualified non-dualism or attributive or adjectival monism, by forgetting its essential tenet that jīva is a substance as well as an attribute. The Dvaita insists on the eternal distinction and difference between jīva and Brahman; Bhedābheda expounds the dual and non-dual relation between the two. Pantheism says that all is God or God is all. But the Viśiṣṭādvaita is different from all these systems as it states that God is immanent in all beings as their inner self and at the same time trans­cendent. Reality and value are one and Brahman is so called because it is infinite by nature and at the same time it can infinitize or Brahmanize the content of the finite self without destroying it. The name Viśiṣṭādvaita can, however, be retained on account of its traditional associations and the rich meaning it has acquired in the historic developments. The Viśiṣṭādvaita is essentially a philosophy of religion in which reason and faith coincide and become reasoned faith. Its problem is: “What is that by knowing which everything is known?” and the answer is “It is Brahman.” Reality is knowable or realizable and not unknowable. The teacher elicits from the disciple that Brahman is annamāyā, prāṇamāyā, manomāyā, vijñānamaya and ānandamaya, and the disciple by a process of spiritual induction seeks to verify them successively. The history of the Viśiṣṭādvaita, like that of other Schools of the Vedānta, claims the authority of immemorial tradition. It is based on the triple authority of the Upaniṣadic seers or Ṛṣis, the Vedānta-sutra of Bādarāyaṇa who systematized their intuitions and the Gītā containing the quintessence of the Upaniṣads. that his system is founded on a work of an ancient teacher, called Bodhāyana vṛtti and the prior teachings of Dramida, Tanka and Guhadeva; it is also traceable to the teachings of Nammālvār, the super-mystic of Śrī Vaiṣṇavism. 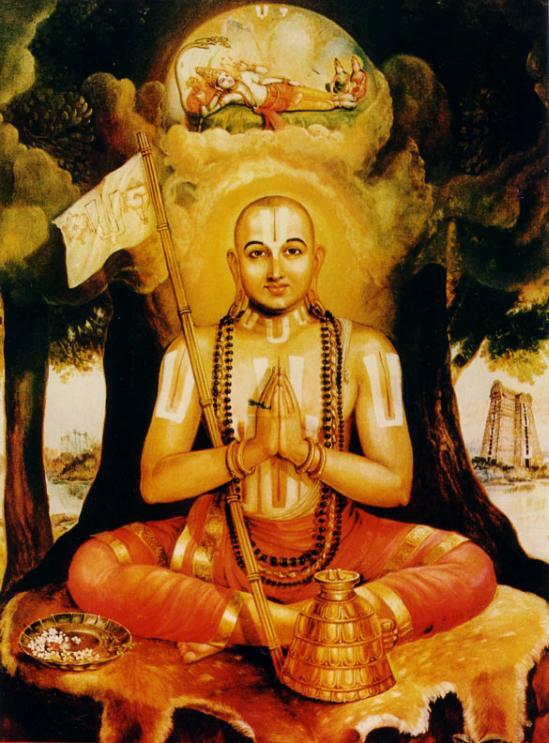 It was Nāthamuni (born in South Arcot in A.D. 824) who belonged to the Bhāgavata tradition from the North, which elevated the Ālvārs' divine songs in Tamil to the level of the Vedānta in the well-known scheme of Ubhaya- Vedānta, which insists on the language of the heart as the true spiritual language, and not merely the spoken word. The next important teacher of Viśiṣṭādvaita was Ālavandār, the grandson of Nāthamuni, who established the Vedāntic value of the Pañcarātra. Then came Rāmānuja (born in A.D. 1017), the Vedāntic successor of Ālavandār and the greatest exponent of Viśiṣṭādvaita. Śankara reinterpreted Buddhist nirvana and thus proved the truth of the Advaita. Bhāskara, who came next, refuted Śankara's māyā theory by his theory of upādhis and Bhedābheda and Yādava, his successor, made Bhedābheda more realistic, and it was left to Rāmānuja to give a new turn to philosophy by his synthetic philosophy of love. Soon after his time, conflicts arose in the interpretation of Ubhaya-Vedānta, the nature of God-head as Lord and Śrī and the meaning of bhakti and prapatti. While Vedānta-Deśika tried to balance the two sides, Pillailokācārya laid stress on the Tamil Vedānta, the monotheistic idea of one God, the efficacy of grace and the social side of the service of God (kainkarya). It deals with the knowledge of reality (or tattva) as Brahman, a-cit and cit, the means of attaining Brahman (or hita), and the nature of attainment (or puruṣārtha). It is an improvement on the Kantian way of stating the problem, namely, “What can I know? What ought I to do? And what may I hope for?" as it avoids scepticism and harmonizes metaphysics, morals and religion. Metaphysics includes epistemology and the study of the pramāṇas and ontology or the study of the three tattvas. Viśiṣṭādvaita morals deal with the Sādhanas or the ways of knowing Brahman and its religion expounds the nature of mukti. Please, Click on the Titles for full Article on each topic! Rāmānuja avoids this impasse by accepting the trustworthiness of knowledge in all its three levels ascending from sense perception, science and philosophy, to the integral and immediate experience of Brahman. Knowledge is the affirmation of reality and even negation presupposes affirmation. If Brahman is real, the world rooted in Brahman is also real and we can go from the partial to the perfect. Rāmānuja’s Viśiṣṭādvaita theory of Truth holds that what exists (sat) is alone cognized and that there is no bare negation.The Absolute is not Brahman versus māyā but is all Brahman (Brahmamaya), and since Brahman is real, the world rooted in it is also real. Truth is the knowledge of a thing as it is and as what satisfies the practical interests of life. The central truth of Viśiṣṭādvaita ontology or theory of being is the identity between the Absolute of metaphysics and the God of religion.It discards the distinction drawn between nir-guṇa Brahman which transcends the duality of relational thought and sa-guṇa Brahman or the personal God of theism as the highest conceptual reading of the Absolute by the popular mind. The cosmology of Viśiṣṭādvaita is based on the integrity of the causal relation in its mechanical, teleological and spiritual aspects of uniformity and moral progression. Brahman is the ground of the cosmic order as its creator, sustainer and destroyer in terms of immanence and transcendence. Creation is not out of nothing, but is only the transformation of the potential into the actual (sat-kārya-vāda). Rāmānuja’s view gives a new orientation to avidya by identifying it with karma, and by attributing the imperfections of life (like avidya, karma and kāma) to the jīva. Every jīva comes from God and goes back to Him as the home of all perfections.Rāmānuja's view insists on the integrity of jīva as a moral and spiritual entity with its own freedom. Liberation can be attained by the triple method of karma-yoga or self-purification, jñāna- yoga or self-realization and bhakti-yoga or the practice of the feeling of the presence of God as Love.Sin in Śrī Vaiṣṇavism is separation from God and true atonement is atonement with the God of love and followed by the practice of service to all jīvas prompted by the divine love in their hearts. Viśiṣṭādvaita distinguishes between the empirical world of space-time and pleasure-pain and the transcendental realm which is also the home of the eternal values of truth, goodness, beauty and bliss. It describes ascent of the mukta after the dissolution of the body to the blissful land of Vaikuṇṭha by the straight and shining path of deva-yāna.The liberated soul has a direct vision of Brahman. The Viśiṣṭādvaita of Rāmānuja is a philosophy of religion which thinks out all things in their synthetic unity of Brahma-jñāna and seeks to realize the union between ātman and Brahman.Every jīva can intuit God directly and serve others by intuiting the truth that all beings are in Brahman and Brahman is in all beings. This view combines contemplative insight and activist view.